Prefabricated modular sections (hereinafter: prefab modules) – this type of construction is suitable for developers who value guaranteed quality and control over time and budget of the project. 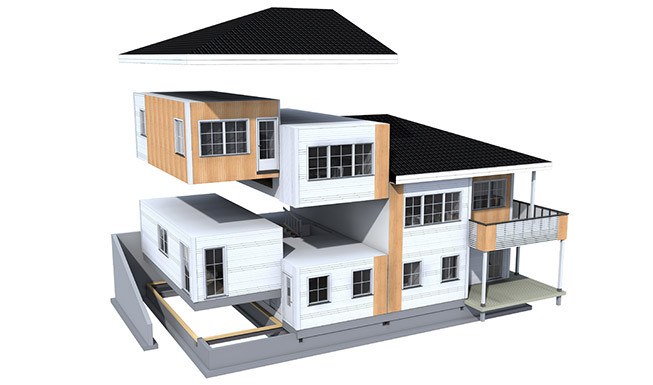 First and very important part of planning a building in prefab modules is DESIGN of the building according to the possibilities of prefab modules and building site. Here can we help you out, because we have know-how and experience in 3-Dimensional designing of buildings in prefab modules. We are able to think in terms of prefab modules when designing a building – thought-out plan solutions and less prefab modules mean lesser cost. In this area Pro-Nor Baltics is co-operating with Kodumaja AS, whose main area of activity is design and construction of prefabricated wooden frame buildings in . Kodumaja is one of the most successful companies who can offer ambitious solutions that meet the requirements of present-day building and standards of their strategic markets in Norway, Denmark, Finland and Sweden. Production process ofprefab modules is efficient and easily controllable. It also enables a large amount of workforce to be simultaneously engaged for faster production. Since the construction phase of prefab modules is about 85-95% finished (piping and cable systems included), it saves time and money on the building site. It is possible to mount up to 30 prefab modules a day. Production at the factory with simultaneous construction of foundations and utility lines on the building site shortens general construction time and minimizes fixed overheads. There are almost no limitations on internal finishing materials, utility systems nor area of use.